Send a personal message of gratitude to an IDF Lone Soldier currently serving in the IDF. You can upload a photo or even a video! 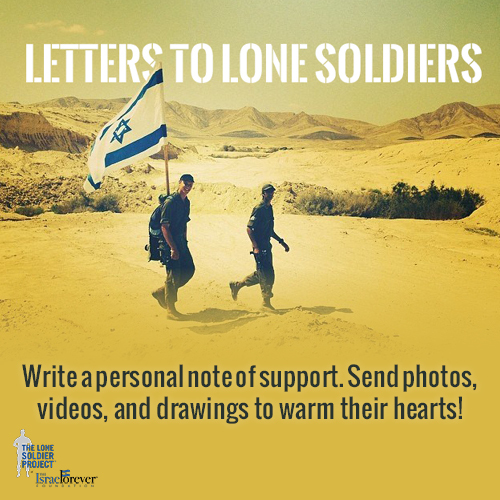 All messages are sent directly to Lone Soldiers through The Lone Soldier Project™ of The Israel Forever Foundation. Please note that while all letters are greatly appreciated, not all soldiers will have the opportunity to reply. Email us at info@israelforever.org with any questions. For more information on The Lone Soldier Project™, click HERE. Post a comment below to add your Letter of Friendship to an IDF Lone Soldier Today!